Spring break has started this week and with that the rainy, gloomy weather too. Its a nice time to be without any schedules and just spend time and bond with my daughter. In her own words- She hates being rushed into doing things to get ready for school. So I didn't set an elaborate plan for the week. We are just going to take each day as it comes and find fun things to do. We have been doing lot of arts and craft. She has also been bitten by the bookworm so spends lot of time happily reading and visiting the library. We did venture out to the park and made the most of the wet sand. Out came the scooter from the storage and she has been enjoying whenever the rain gods gave us a break. Yesterday we spent the whole afternoon baking together. I had a few sad looking bananas in the fruit bowl and my daughter had been pushing for banana bread. We made it a little festive and fun by adding chocolate chips into it. I found the perfect recipe at The Gluten Free Goddess Blog. I have tried many of her recipes with success. 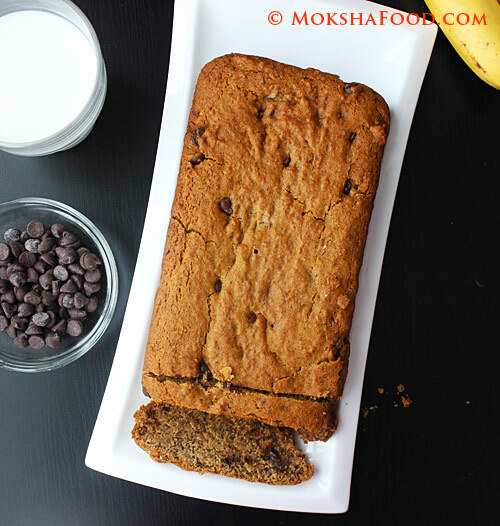 This Gluten Free Vegan Chocolate Banana Bread was soft, moist and delicious. It didn't rise much but tasted great. We also made Gluten free Granola. I will try to post the recipe soon. Prepare the loaf pan by lightly oiling it and dusting with rice flour. Shake off the excess. Combine the wet ingredients in another mixing bowl. Add the dry ingredients gradually into the banana mixture and stir until smooth. Pour the batter into the prepared loaf pan and bake in the center of a preheated oven. The original recipe asked to bake for an hour but my loaf was done in 50 minutes. Test by inserting a toothpick in the middle of the loaf. It should come out clean. Remove the banana bread from the oven and let it cool on a wire rack. Slice into thick pieces and serve. My daughter was drooling all over the loaf so had to cut it out earlier. 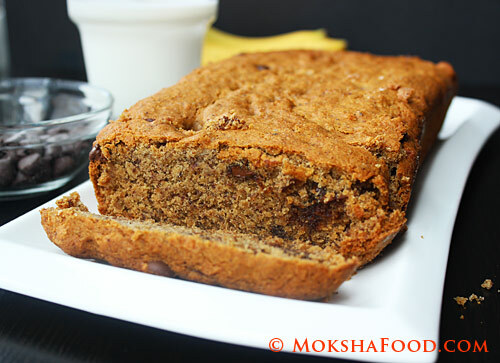 She enjoyed the slices of chocolate banana bread with a glass of milk. The next day too, the bread tasted great. I just zapped it in the microwave for 10-15 secs to warm it and let the chocolate chips melt a little.